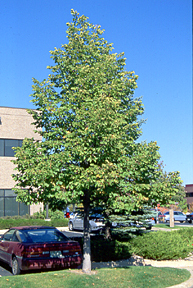 This Tree in Colorado American Linden in native in the northeast but is a hardy tree that can grow well in Colorado. Growth rate, form and size Large tree with a long trunk and a dense crown. The crown is often full of many small branches and large leaves. Often grows to 70 or 80 feet tall and matures in 90 to 140 years. Foliage 2-1/2 to 7 inches long, 2 to 6-3/4 inches wide, with a broad to wide shape and coarsely serrate along the margin. The base is unequal, giving the leaf a heart shaped, or cordate, appearance. 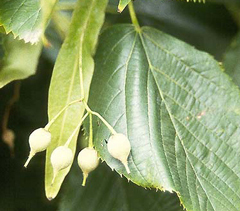 It is significantly larger than the Littleleaf linden, which is also planted in Colorado. Fall color is yellow to orange. Flowers Appearing when the leaves are nearly full grown, ½ to 5/8 inches wide, borne in few-flowered cymes, on a long and slender stalk, attached to a bract. Fruit 1/4 to 3/8 inch diameter nutlet, with ribs and attached to a persistent bract. Bark Green or grayish on young trees, and as it matures breaks up into gray to brown narrow ridges. Landscape value Makes an elegant shade tree in streets and parks. When choosing a location for this tree, one should keep in mind that bees favor it and is sometimes called the “bee tree”. The wood is also a favorite in the lumber industry. Its leaves hold significant amounts of calcium, magnesium, nitrogen, phosphorus, and potassium; therefore, this tree is capable of improving soil conditions wherever it is planted.